In 12-inch nonstick skillet, cook stir-fry vegetables and dressing over medium-high heat 2 minutes. Stir in broth; heat to boiling. 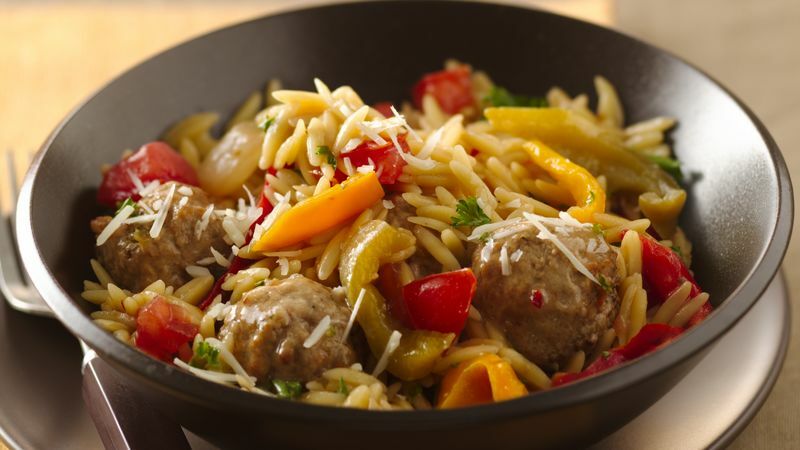 Stir in pasta and meatballs. Heat to boiling; reduce heat to low. Cover; cook 10 minutes, stirring occasionally. Stir in tomato. Cover; cook 3 to 5 minutes or until most of the liquid has been absorbed and pasta is tender. Stir in parsley. Sprinkle with cheese. Our Easy Meatball recipe would be a delicious variation. Orzo is a rice-shaped pasta that cooks fairly quickly. It's a great pasta to serve to kids because it is easier to eat than long spaghetti.